Day 280: Seared Veal Sweetbreads from Maison Boulud. 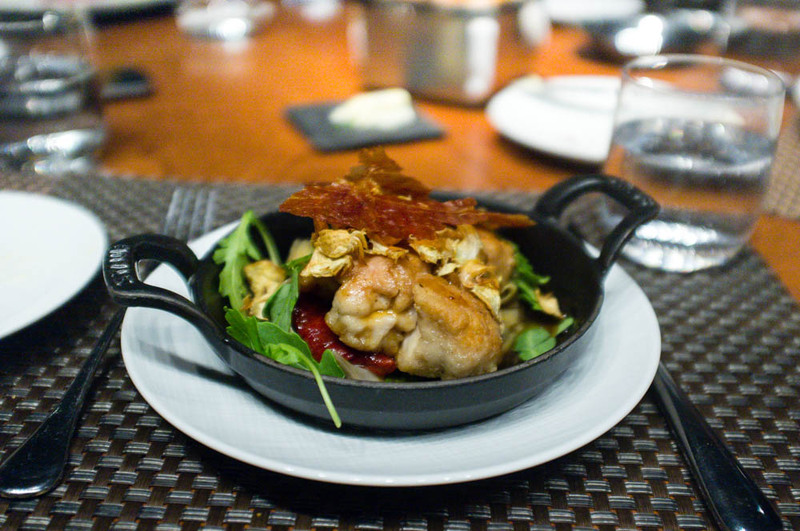 I don’t have sweetbreads often but when I am at a place like Maison Boulud, there is really no better place for it. Seared crispy on the outside and still creamy on the inside, this rich dish was certainly not light but amazing regardless. 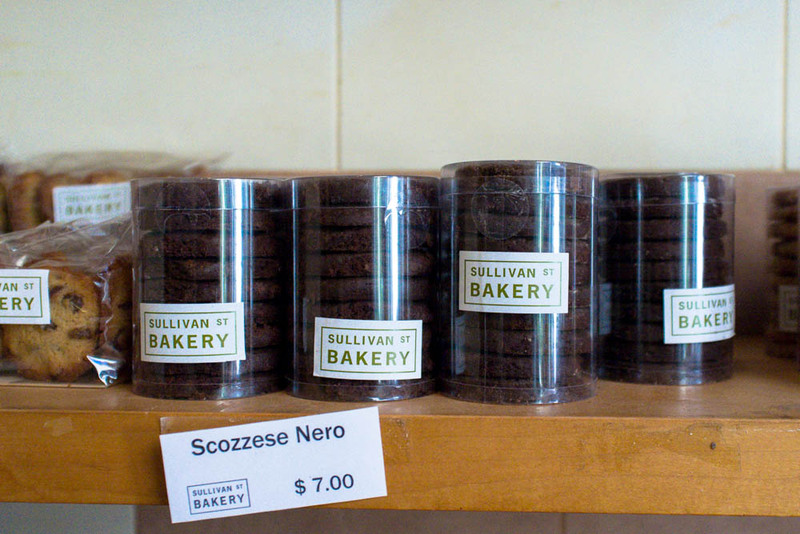 Day 281: Scozzese Nero at Sullivan Street Bakery. The Chinese Consulate all the way on the Westside Highway can be such a pain to get to but there is a silver lining to the trek. On the way back, I always make a note to stop by Sullivan Street Bakery for some treats. Tuesday’s pick was scozzese nero, a dark chocolate shortbread with a salty bite. Day 282: Wednesday night special at Mooncake Foods. Mooncake Foods is a staple in my rotation of quick casual places for dinner in my neighborhood. I typically go for their delicious miso glazed salmon but this time, I chose their Wednesday night special of the grilled tuna steak instead. 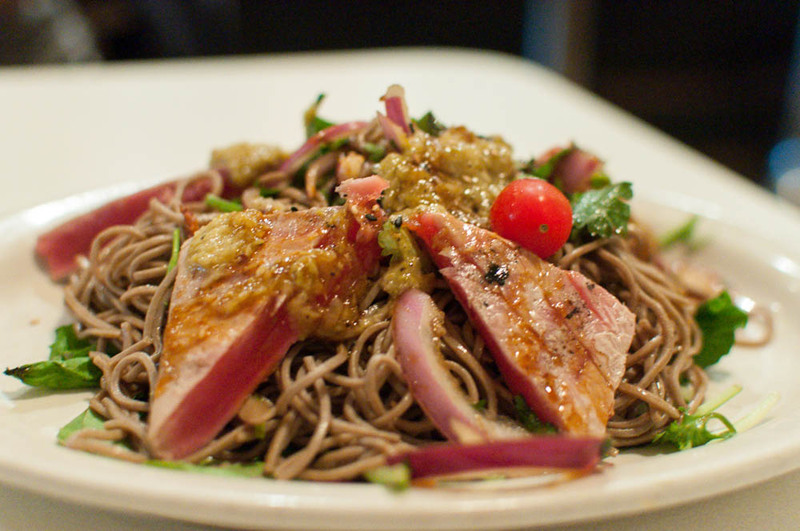 Lightly seared tuna was served on top of springy soba noodles and topped with their spicy green sauce – light and healthy, I couldn’t have asked for a better meal before tennis. Day 283: Cider Doughnuts and Fist Pumpkin from 16 Handles. Now that fall is officially here, it only felt appropriate to celebrate with a swirl of cider doughnut and another swirl of fist pumpkin. 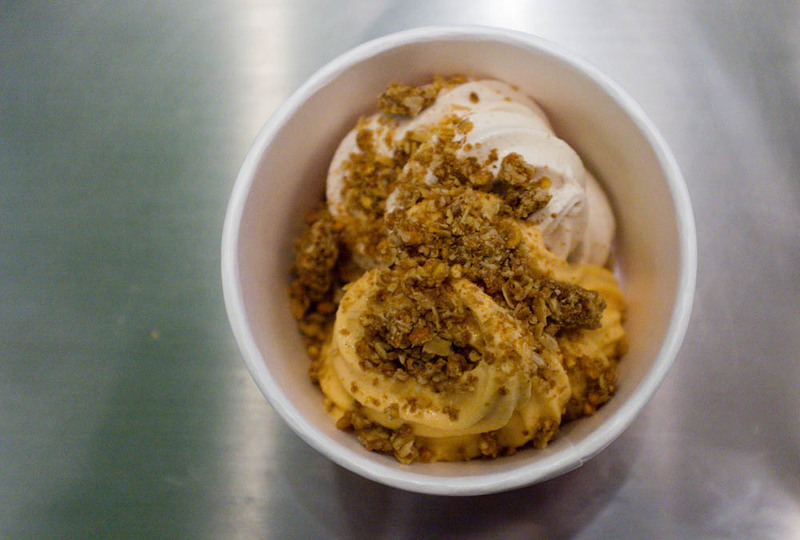 I left behind my typically shredded coconut and went with a fall themed granola crunch instead to round out this sweet treat. Day 284: Spicy Roasted Rice Cakes from Ma Peche. Knowing I had a wonderful ramen tasting ahead of me later Friday, I opted for a bowl of Ma Peche’s roasted rice cakes instead. Tossed with spicy pork ragu and water spinach, the little bites of rice cakes were chewy with crunchy bits and absolutely fiery on the tongue. 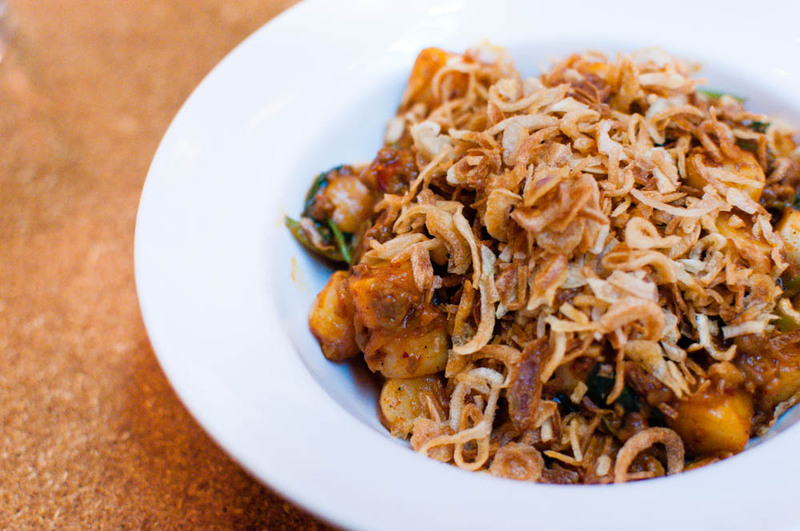 There really in no mercy in this bowl and that is exactly what I love this dish. Day 285: Cheddar and Cucumber Sandwich. We woke up early, quite early, for a drive to the Catskills for an overnight camping trip. We stopped by a waterfall for lunch before finally reaching out camp site. Even though we had only marched about a mile, the heavy packs really worked up our appetite. 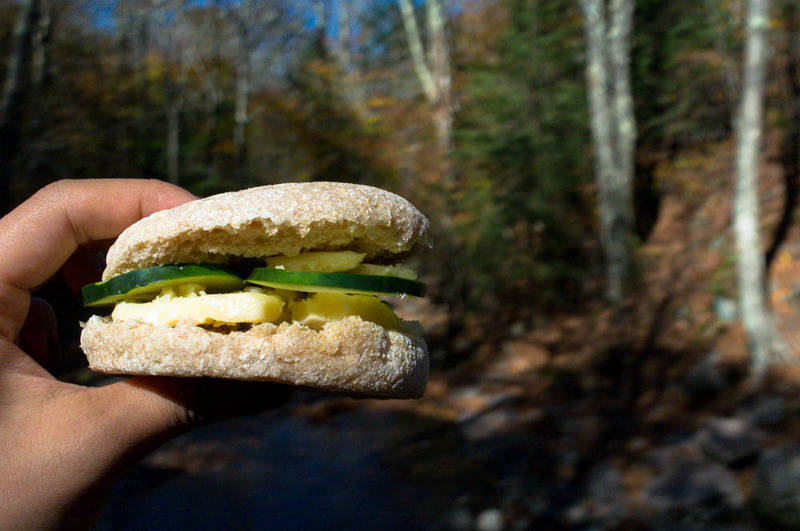 I happily munched away on my spelt muffin with slices of sharp aged cheddar and refreshing cucumber slices. Day 286: Might Wings at McDonald’s. Yes, that’s right, I did it. I tried the newest product from the grand empire of McDonald’s. I am not ashamed to say that these were quite delicious. 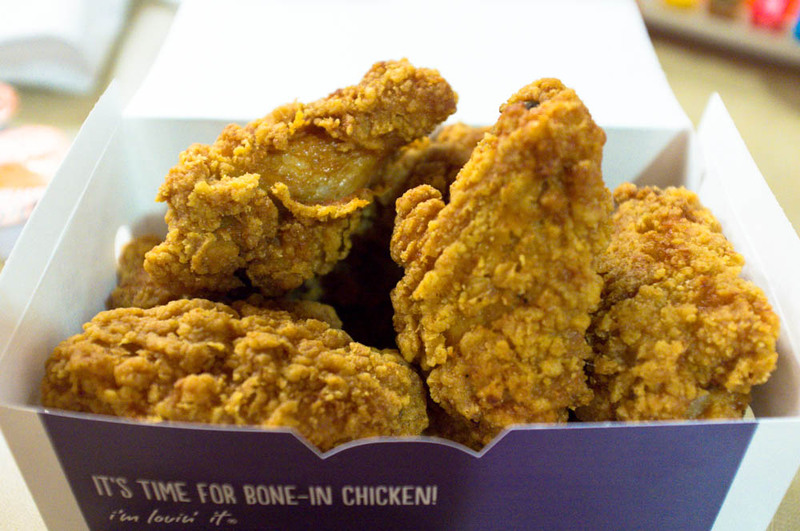 Crunchy exterior and moist spicy interior – not too shabby for the good old Mickey D’s.